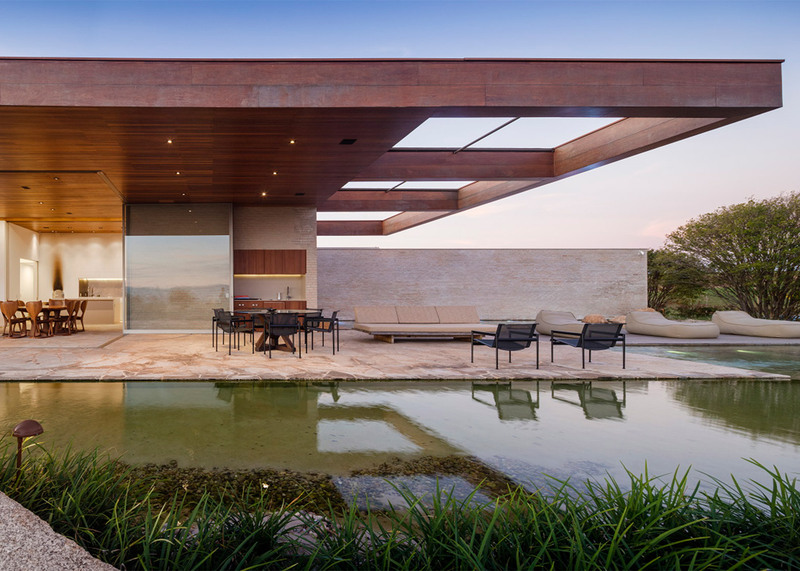 Glass walls slides and fold open to completely reveal the living spaces of this house in Brazil by Studio Arthur Casas, allowing residents to look out on their swimming pool and over the golf course beyond (+ slideshow). 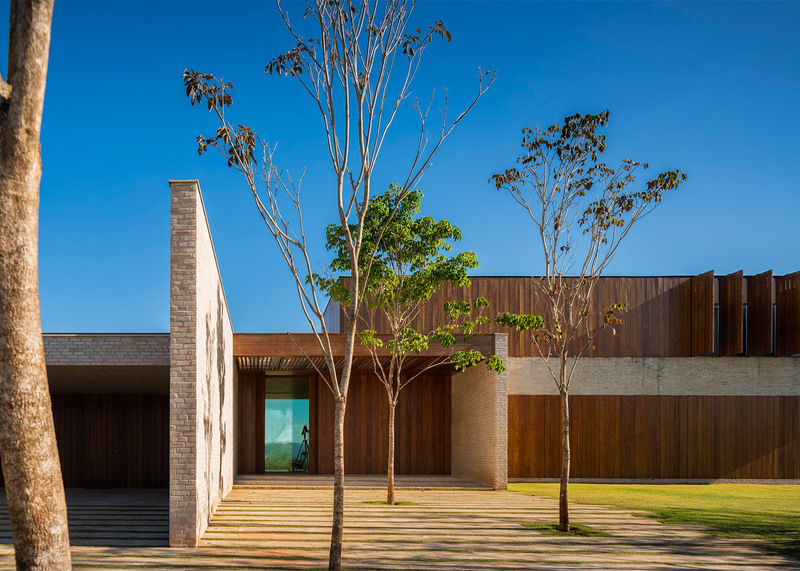 Casa MS is situated at the Fazenda Boa Vista golf resort, around 100 kilometres west of São Paulo. 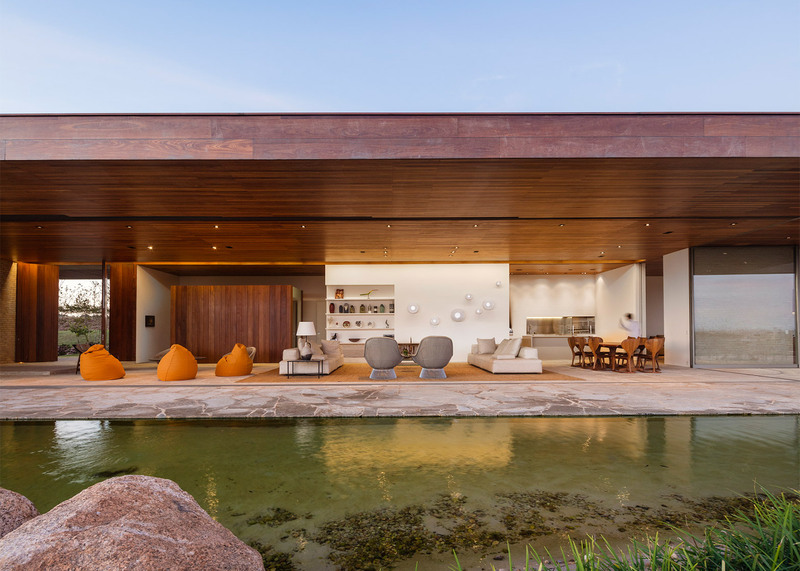 It was designed by local firm Studio Arthur Casas for a couple with three grown-up daughters. 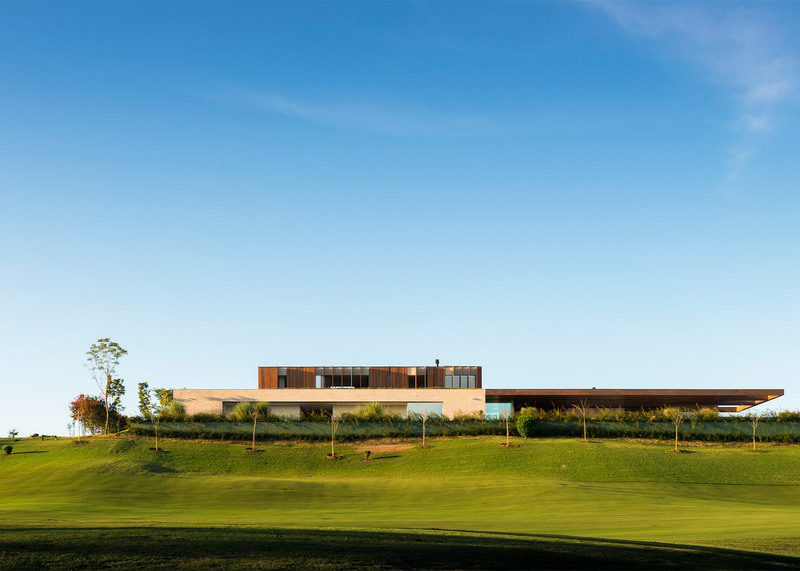 The plot follows the edge of the golf course – not far from the clubhouse designed by Brazilian architect Isay Weinfeld. 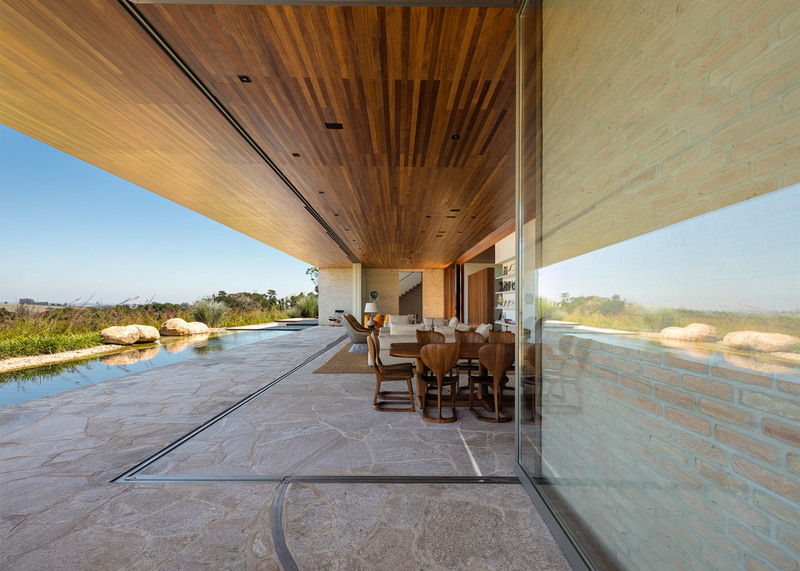 This location provides the building with extensive views of the nearby woods to the south, which led Studio Arthur Casas to position most of the glazing along this edge of the building. Only a selection of windows were added to the street-facing northern facade, ensuring natural sunlight is able to enter the building. 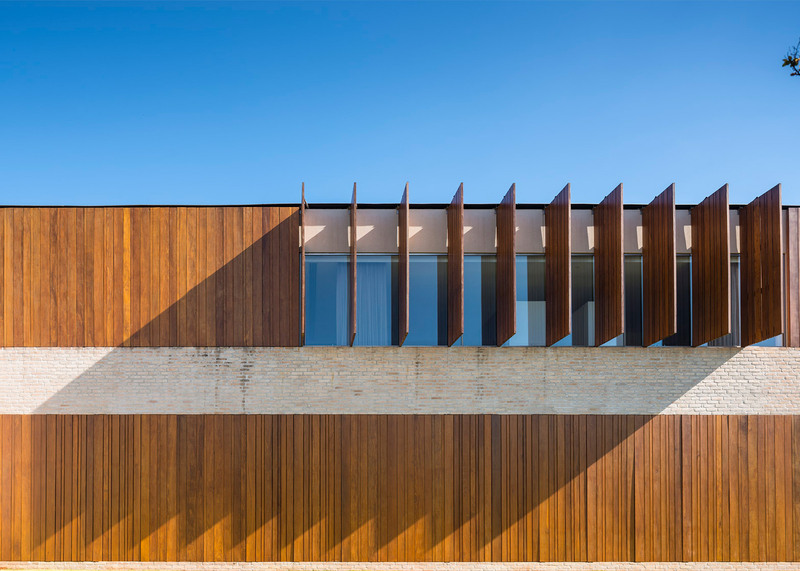 "The solution was to arrange the spaces following the latitudinal axis of the plot in a manner that would provide framed views to the landscape and bring the sunlight altogether," said the studio. Four bedrooms for the family's daughters and guests are arranged along the northern edge of the ground floor, with large hinged wooden shutters and a densely planted garden protecting them from the road. 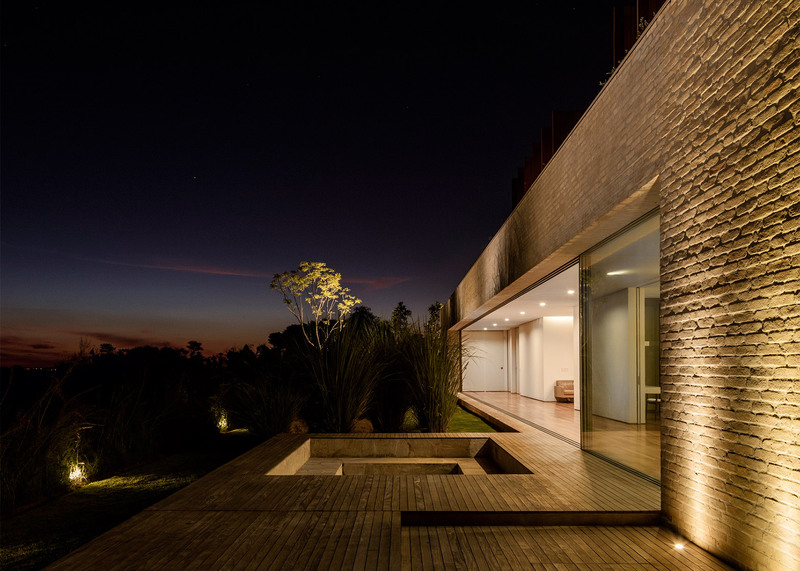 When the shutters are closed, they form a solid surface above and below a strip of pale brick that marks the separation between the ground and first floors. 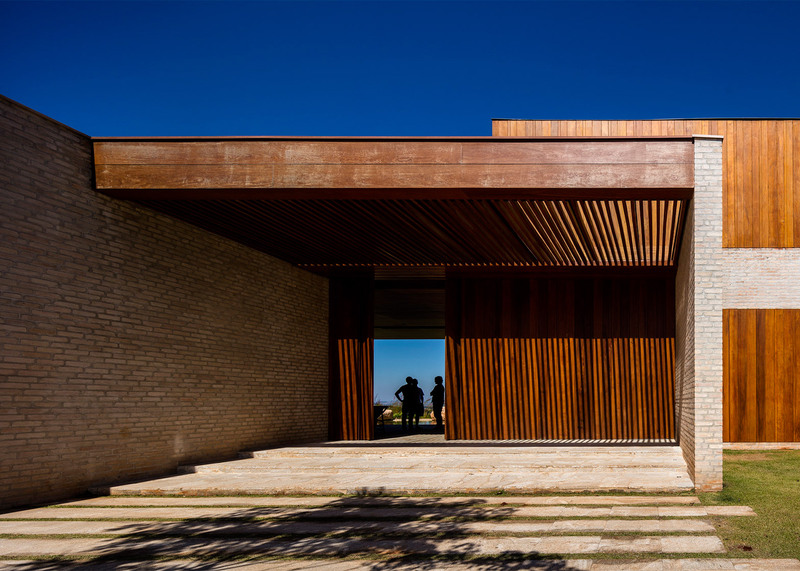 At the eastern end of the property, a brick car port and entrance are sheltered beneath a slatted canopy that casts strong linear shadows on the wooden walls. 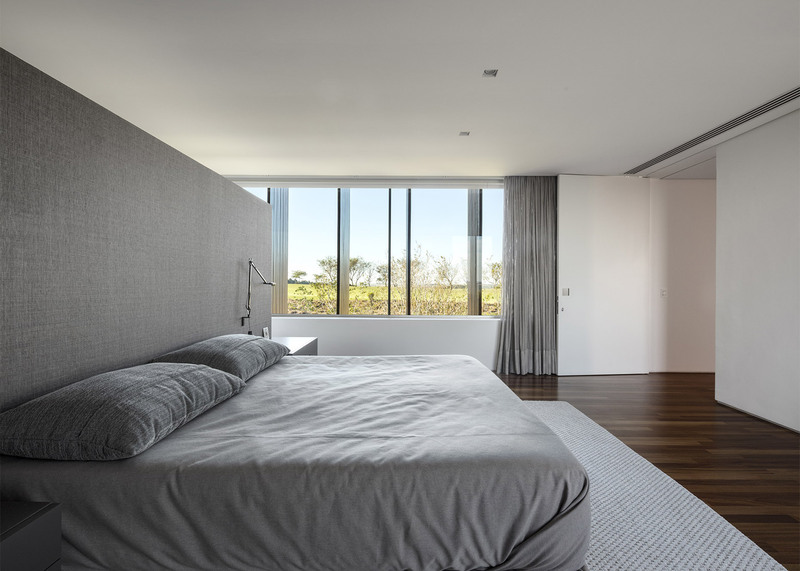 The bedrooms line a corridor that separates them from the open-plan south-facing living areas. When the full-height windows lining the lounge and dining spaces are retracted, these rooms merge seamlessly with a large poolside terrace. 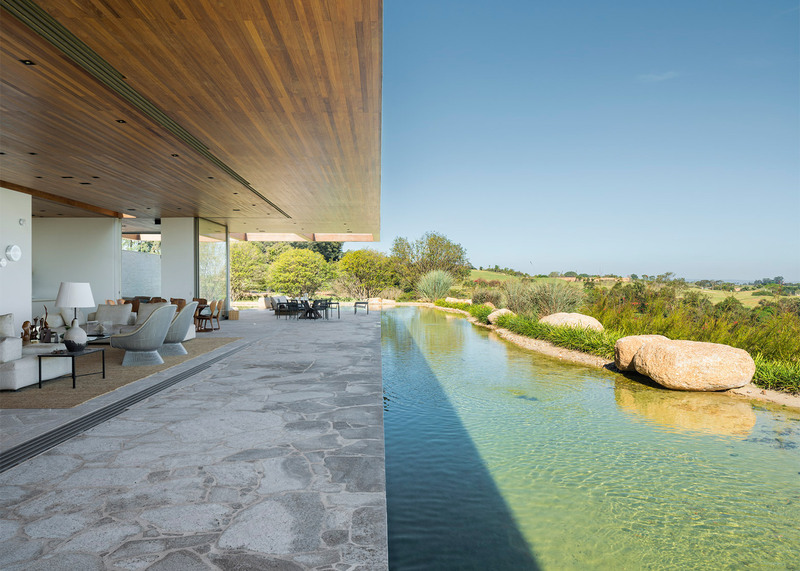 The pool extends along the house's edges, helping to cool the air and aiding natural ventilation. It contains fish and plants that cleanse the water, which is only 50 centimetres deep in most places but deeper at one point to create a swimming area. 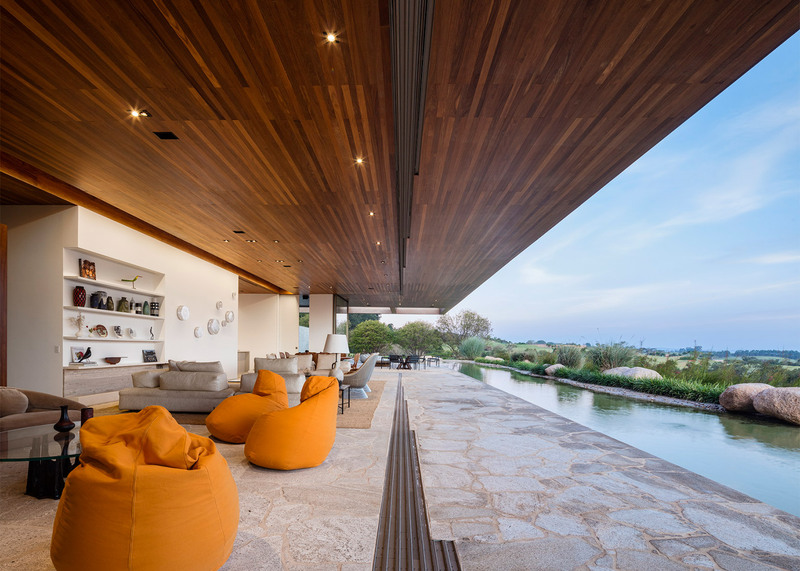 The sense of continuity between the indoor and outdoor spaces is accentuated by the use of the same stone flooring and the cantilevered timber-clad ceiling. 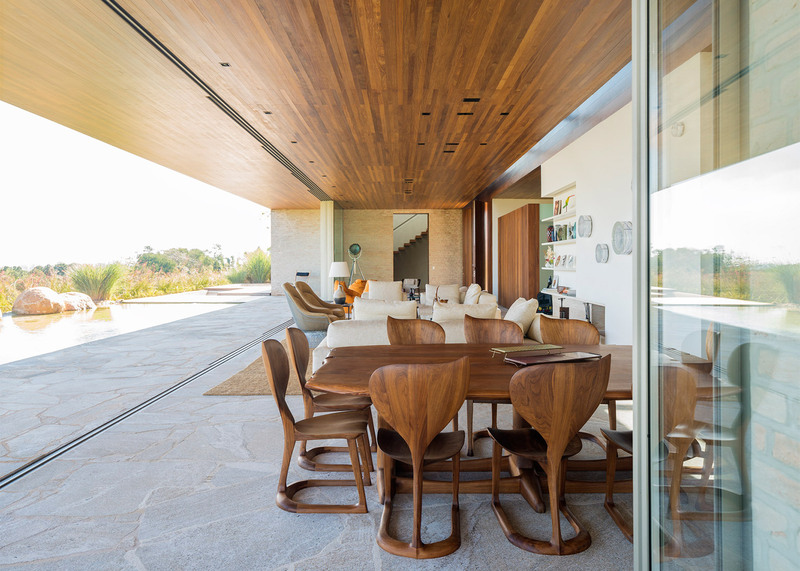 The most private areas are distinguished through the use of wooden flooring. Sliding walls separate a kitchen and home theatre from the main living space, but these can be pulled aside to create one continuous space. Meanwhile, a powder room and cellar are tucked away in a timber-lined box. A wooden deck extends along the brick-clad western portion of the ground floor. 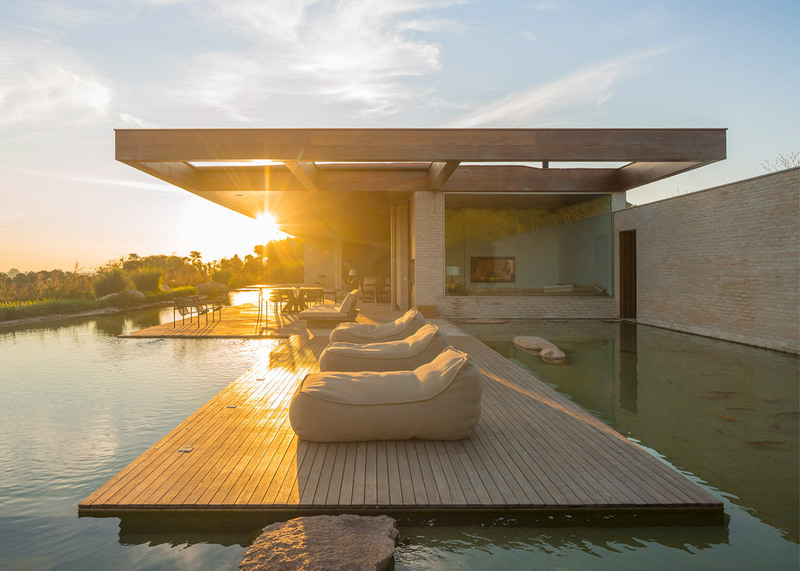 It contains a jacuzzi concealed beneath its surface and a fire pit for evening gatherings. An opening in the brick wall of the lounge area provides a glimpse of an atrium containing a staircase, leading to the master bedroom suite and atelier on the first floor. The staircase's wooden treads cantilever out from the atrium wall and are illuminated from above by a large skylight. A colour palette comprising warm tones of orange and terracotta borrows from the surrounding landscape. These hues complement the timber and brick surfaces, which in turn offset the cooler and harder stone flooring. Arthur Casas founded his studio in 1999. 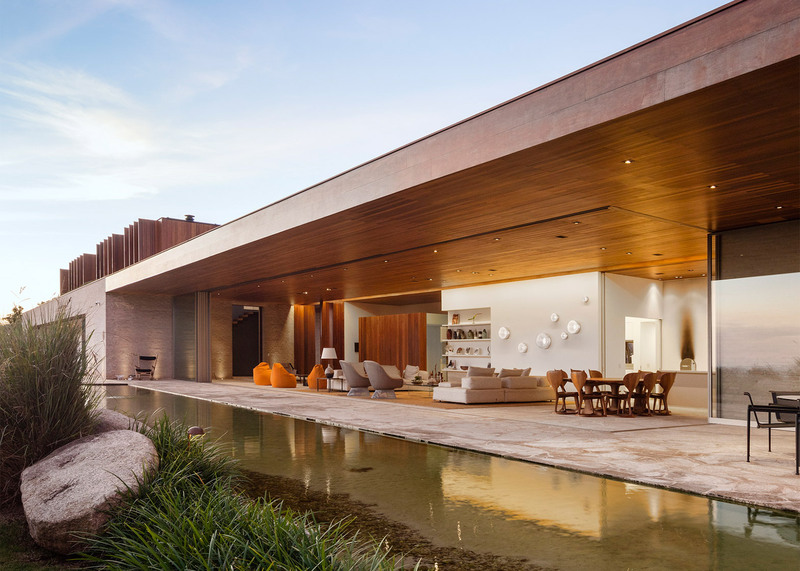 His other residential projects include a hillside house facing the ocean near Rio de Janeiro, a lakeside home with sliding glass walls and a house for a stylist clad in perforated gold panels. Photography is by Ricardo Labougle.